The city of Fairfield, Iowa is an art powerhouse in the Midwest. Among its population of approximately 9,600 is an unusually large percentage of artists, and at one time there were 19 art galleries in operation. There are key people at work—and working hard—to make the Fairfield art scene happen. While I want to eventually mention all of those involved, I’m starting with Bill Teeple and ICON Gallery. A California native, Bill first visited Fairfield in 1975 and permanently relocated there in 1998. As an art teacher with a teaching studio, Bill’s involvement with the Fairfield art scene gradually blossomed into ICON Gallery, aka Iowa Contemporary Art. Because of the work of Bill and the many volunteers that comprise its membership, ICON Gallery is actively doing its share to keep the arts thriving in Fairfield. With a nominal yearly membership fee, ICON members can attend such things as lectures, films, dialogues, and presentations at the Gallery, along with the opportunity to go on special group outings and trips to museums in the Midwest. Bill, Allen Cobb and Donna Colby, also co-host a weekly ICON radio show on Fairfield’s local station KRUU, discussing art issues and interviewing artists. Through Bill’s keen insight and careful direction, ICON Gallery has been recognized as an important site for artists to have their work shown. His reputation as a teacher is also noteworthy as he’s helped many of his students realize their own artistic visions and to discover just who they are as artists. Many of Bill’s students cite how much he has encouraged them and helped them grow and mature artistically. Talking with Bill Teeple about art is an experience itself and the interview that follows gives a hint of that experience. Bill Teeple, artist, teacher, visionary, and the guiding force of ICON Gallery. Painter’s Bread: How did you start in the arts? How/when did you realize you were an artist? Bill Teeple: I took being an artist for granted. I could draw well from childhood. I can still remember, as though it was yesterday, setting up my first still life to paint when I was eight. Drawing and painting was just another thing I did. I didn’t identify with being an artist until I started winning awards in High School. I decided to major in art and started at Cal State Long Beach, but transferred to Berkeley when it seemed like everything was happening in the Bay Area. I got art fundamentals in Long Beach and I got exposed to the edge of reality in Berkeley. A well-rounded education. PB: You graduated from Berkeley with a degree in art; who influenced you the most there? BT: Jim Melchert comes first to mind. He was a great teacher—really interested in his students. I was influenced by everyone around me. Peter Voulkos, Harold Paris, Ron Nagle, Robert Hudson—especially visiting artists like David Hockney and R. B. Kitaj. At Cal State Long Beach, Conner Everts had a huge impact on me. He really worked outside the box. I’d never seen anything like that before in a teacher. Sign for the annual Large Works Show at ICON. PB: When and how was ICON Gallery conceived? BT: Because Fairfield is an art colony of sorts, the populous already has a demand for the arts within its culture. I had a teaching studio and decided to move it to 51 East Broadway. There happened to be two more empty offices complete with track lighting, so I decided to hang the work of some of the great Fairfield artists in those spaces. One thing led to another and before long, we started doing openings, advertising, post cards, and a membership program. Eventually, ICON was officially formed as a 501c3 non-profit organization and then moved to its present location on the west side of the square in downtown Fairfield. PB: Is it possible that the concept of ICON Gallery can be implemented in other cities around the country? BT: Yes, and the concept of satellite locations has interested me. I would like to extend the vision of ICON to Des Moines, given the right opportunity there. PB: What do you see as the future for the Fairfield art scene and is there more to be done? BT: Fairfield can be a player in 21st century art if the serious artists here step up to the plate and take the pitch. We have to not be afraid to ask the big questions and attempt to solve them in our work. We are at a huge turning point in culture. It’s totally up to each artist how deep he/she wants to go. PB: What theories or beliefs do you have regarding creativity or the creative process? BT: Art is an experience and the artwork is a commentary on that experience. The success of the artistic process is the depth of the experience and the truthfulness in the commentary. People should be focused on the depth of their experience—the crucial element in art is the experience. Otherwise, you don’t have anything to say. But then you have to drive that experience into material form. At every step of the forming process you have to be true to the experience. I also use what’s now considered a dirty word in the art community—beauty. By beauty I mean wholeness and just-rightness, and in a work of art there can’t be wholeness without just-rightness and vice versa. We must ask ourselves if the expressions of creative people are conveying the qualities of wholeness and just-rightness. Beauty transcends, and when art transcends its parts, it delivers a flash of what life is. View from upper gallery looking down to the lower level. PB: How do you approach the teaching of art? BT: I didn’t decide to be a teacher. The opportunity came to me. However, everything I had done up to that point had prepared me for the task. It was just a matter of stepping onto the stage. I’m very intuitive in my approach to teaching. I don’t know how I feel about a student's work until I hear myself talking about it. I feel like a funnel. All my years of experience and practice get channeled into the words that come out of my mouth. When I teach like that something magic happens between me, the student, and the work. PB: What advice do you have for those who may want a career in art? BT: Don’t quit your day job. It’s better to be making art that’s true than making a living selling your art. However, always know you are first and foremost an artist and the day job is just what you do to continue to paint. If you are making art that is true, it will find its way. View of stairs leading to the upper gallery. The teaching studio can be seen through the doorway below. PB: Books that you would recommend? BT: I could recommend a lot of books, but I feel it’s most important to connect with your sense of inner knowing. Books and teachers should be approached to validate or challenge what you feel to be true—all to strengthen your inner truth. Never do anything because you think that’s what others would have you do. Get clear on what you know and what you don’t know and then move forward based on what you know. PB: What contemporary artists or developments in art interest you? BT: I’m interested in every development in art. Art is a record of the development of the self. Art today is looking for meaning and is desperately asking the question of what art is, and the viewer is participating in that questioning. Each person is being asked to find the answer to that question within their self. More information about Iowa Contemporary Art Gallery can be found at: http://www.icon-art.org/ . Recently, I came across a folk art phenomenon that's been around since the 1800's--the cigar box guitar. Across the U.S. and in other counties, people have been making guitars, banjos, and other instruments from mostly found materials. In fact, the goal of many guitar makers is to craft one of these from as many found items as possible and still have an excellent sounding instrument. A great resource for this form of art is the website Cigar Box Nation, which provides photos sent in by builders from around the world along with advice, plans, and videos. 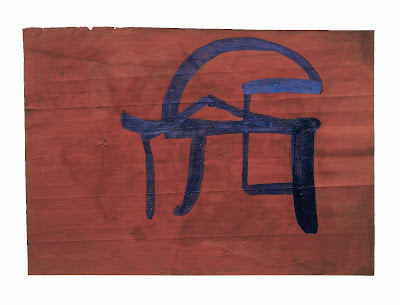 2006, gouache on paper on panel, 30" x 22"
The artist Tauba Auerbach is a unique blend of graphic designer and painter. The obsessive nature of her interaction with type is just plain interesting and the result is visually compelling. Lately, the internet has been abuzz about her work and this post is just one of many. 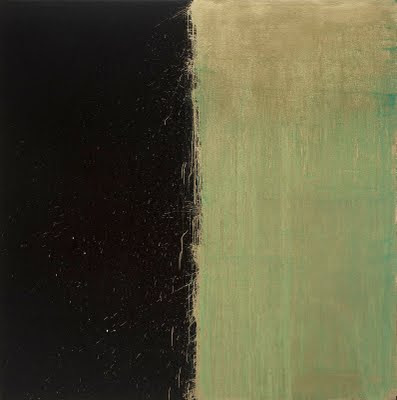 Art in America has an insightful interview with Auerbach here, and more of her work can be seen at taubaauerbach.com and artsy.net. 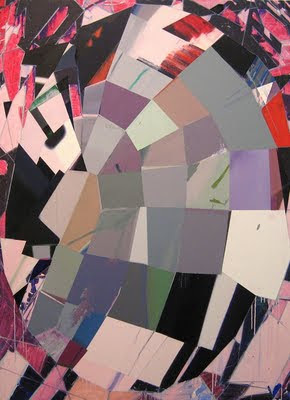 The paintings of John Sonsini are imbued with a heaviness of materiality. They state that they are not illustration. Paint is slathered on with plenty of brushwork. 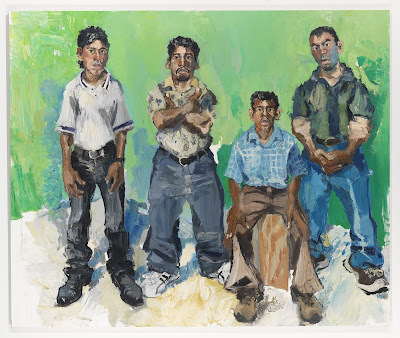 Neel, Soutine, Bellows, and Sorolla come to mind. Images Courtesy Cheim & Read, New York. Suppers, 2007, oil and acrylic on panel, 24" x 24"
Scapegoats, 2008, oil on panel, 18" x 18"
This guy has an interesting personal background: BFA in painting from Virginia Commonwealth University, MFA in painting from Hunter College, former assistant to Franz Ackermann, and lead vocalist in a band. I really like what he's done so far and will be watching for his new work that, according to Pat, will be ready soon. 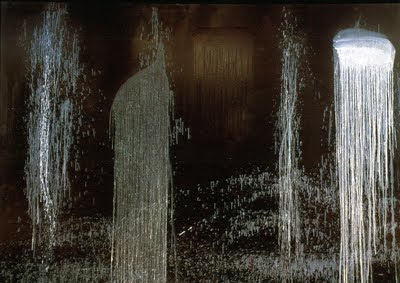 WATERFALL OF FUNDIMENTS, 1990, oil on canvas, 92" 1/2 x 132"
Viewing the work of Suzan Frecon can be a challenge. Seeing her paintings is enlightenment. Suzan Frecon is a painter who often works with raw pigments, exploring their characteristics and applying them with sensitivity and sincerity. She’s been on a long and steady path of progression and her compositions are the result of looking, thinking, working—and more working. Whether painting on canvas with oil or on old Indian ledger paper with watercolor, Frecon strikes a balance between her influences and her own intuition. 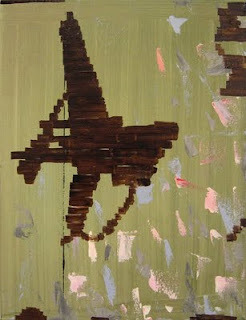 Suzan Frecon is a “painter’s painter”. Entanglement, 2009, oil on linen mural, 57" x 54"
In 1977, Sue Hettmansperger joined the faculty at the University Of Iowa School of Art in Iowa City, and has been an important influence there ever since. I first saw her work at a U of I faculty art exhibition some years ago. What impacted me most were her color sensibility and inventiveness of form. The paintings also exude a quality I refer to as “tug”—they pull you closer. As I was drawn in, I was in awe of their finish as the mark-making became evident. The many layers of brushstrokes in a wide spectrum of color almost seem knit together. 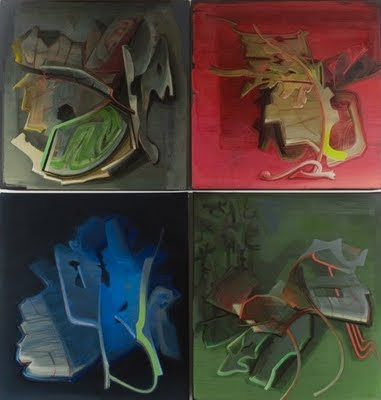 Chimera, 2007-2008, oil on linen, 27" x 27"
In an interview with Sue, I asked her about the forms in her paintings as they seem to be in a state of metamorphosis. She told me that in her earlier work, she used more organic forms from nature, but has increasingly incorporated more diverse sources for her imagery such as man-made objects. I commented that the paintings seem timely and emblematic of what may be occurring in nature right now and she shared with me her concept of “the complexity of life embodied in a painting” and that there is a definite “fusion and entanglement” to her forms that can be interpreted as ecological. As for her colors, Sue credits a video collaboration as an influence on their recently more intense saturation. Her husband, who is a composer, wrote the music while Sue added the graphics. The digital video with its “acidity of color” as Sue said, opened up another range of color for her that she eventually used in her paintings. Towards the end of my interview with Sue, we talked about how painters should keep on progressing in their work and she summed it up, taking that thought one step further by saying, “paint to learn about life”. Sue Hettmansperger’s work can also be seen at A.I.R. Gallery. Almost every art department at the university level now has a computer graphics lab--the influence is undeniable. The quote by Philip Guston, “we are image makers and image ridden” is also illustrated each time we turn on our own computers. 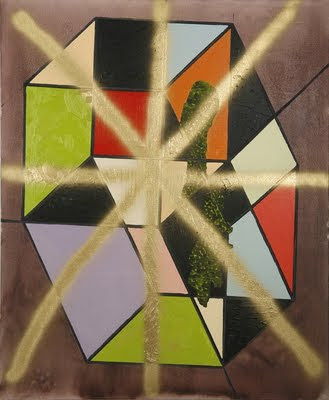 In the work of Jered Sprecher, the sheer appreciation of paint is evident, but a dialogue with technology also exists. References to digital painting via computer are sown throughout his work of the last few years. Titles sometimes make direct references to features found in Photoshop, while some of the paintings also contain images of cursors, semicolons, and the precise geometries that can be attained with software. Sprecher’s paintings are a balance of hard-edge technique with painterly brushwork and it’s that combination that creates a certain tension. The paintings aren’t totally hard edge, but given the influence of the computer, they sure could have been. It’s as if Sprecher is tempted by the precise edges found in computer imagery, but his hand and his brushes have overcome the temptation of technological perfection. I had the privilege of interviewing Jered Sprecher and when asked why he chooses to paint, he explained that he’s always wanted to make things and use his hands to “think about ideas” while sorting through the numerous images that he comes across each day. He went on to say that he considers his works “hybrid creatures” that are the product of his practice of “image making by any means possible”. 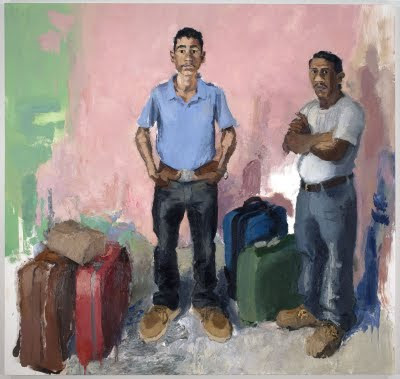 I commented on how some of the paintings seem to convey movement and Jered acknowledged that there’s an “expanding and contracting” quality to them, but they also have a “sense of unease” as if they’re “not quite resolved”. 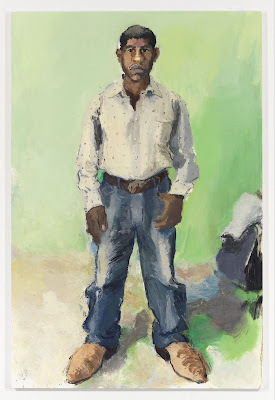 Since studio practice is one aspect of painting that differs among artists, in describing his own way of working, Jered said that he doesn’t use preliminary drawings, but starts with just canvas and paint, which confirmed my thoughts that with Jered Sprecher, paint really is paramount.